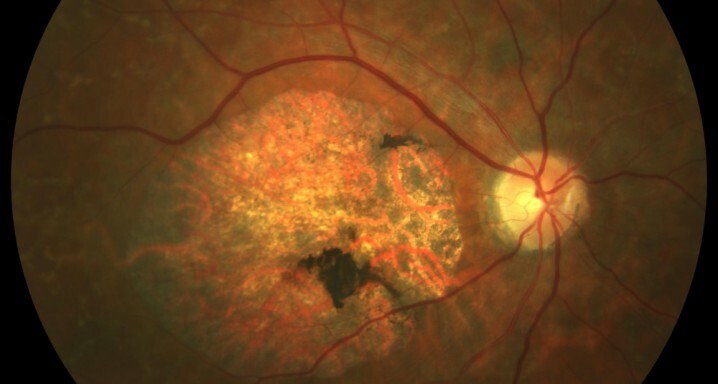 Stargardt disease is the early degeneration of the retina due to genetic causes. The macula, the part of the retina responsible for central vision (the vision we use to read, watch television or recognise faces) is primarily affected by this illness. This is the most common form of hereditary juvenile macular degeneration, with an estimated prevalence of between 1 per 8,000 and 1 per 10,000. When is Stargardt disease most likely to occur? It is normally diagnosed in people aged under twenty although loss of vision may not become apparent until the third or fourth decade of life. Stargardt disease is a genetic illness. Approximately 90 % of the cases are transmitted via a recessive gene. This means that, for someone to have this illness, both parents must have the affected gene. In this case, the possibility of having a child with this disorder is 25 %. As it is a recessive gene, there may be no family history of Stargardt disease, so that the parents may be carriers of the gene without having developed the disease. The symptoms related to Stargardt disease usually begin gradually. Children or teenagers complain of problems with reading and gradually notice grey or black zones (blind spots) in the centre of their visual field. Sight loss is progressive and varies depending on the patient. There may be very serious loss of sight. Periphery and night-time vision are not lost in the vast majority of patients but, during the later stages of the disease, the vision of colour is also affected. A thorough ophthalmological examination is crucial, which also includes the following tests: a retina scan, autofluorescence, optical coherence tomography and, in some cases, microperimetry and visual field campimetry tests. There is currently no treatment for this pathology although the research being carried out worldwide is very intense and promising. In this respect, the Institut de la Màcula collaborates closely with the Barcelona Macula Foundation: Research for Vision, a foundation specialising exclusively in research into retinal illnesses that cause blindness, within which Stargardt disease is a priority. The aim of this collaboration is to find solutions and treatments for those illnesses that are still incurable and cause blindness. In any case, patients with this disease must avoid supplements containing Vitamin A and are advised to wear glasses with UV protection.